SHOPPING AROUND FOR INSURANCE SAVES! Have you ever bought something only later to find out that you could have gotten the same item cheaper elsewhere? PolicyBachat came into existence for this very reason and that is to help people all over the nation SAVE when buying insurance. Insurance is needed, but overpaying isn't! Whether it's car, two wheeler, life, health or travel insurance, the rate you pay with one company differs from the rate you would pay with another, so much to say that no two insurers are alike. And, it is for this reason that you need to comparison shop your insurance needs; otherwise you run the risk of spending too much on your coverage. Be instantly provided with the lowest insurance quotes available from our network of licensed insurance professionals! Once you're satisfied with your quote, make sure to lock it in by speaking with our professional agents directly, who can help get you setup with your new policy. Get on the road to a hassle-free process! We know life can get busy and that's why we make the entire process of shopping for insurance quick and easy so that you can get back to your day as soon as possible! Today's insurance market is incredibly competitive, which means that insurance providers will often go the extra mile to get your business. Don't let the competition get you all boggled up, but rather use it to your advantage! 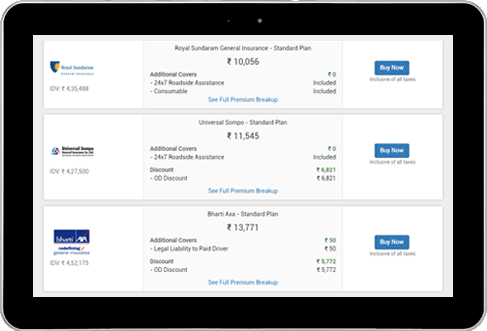 Shop smart with Policy Bachat by picking at least three quotes from reputable insurance providers. Once you've done that, look at each one line by line to make sure you're comparing apples to apples. A side-by-side comparison will help you to determine which one will give you the best coverage for your buck! Policy Bachat offers national resources, plus the stability, creativity, and expertise to deal with even the most challenging risk situations. Providing security and value through custom insurance solutions is what we excel at. Each and every one of our employees upholds the highest standards of business ethics and we have the utmost respect for our customers and employees alike. "It's nice to know what your policy covers, but it is equally important to understand what your policy doesn't cover. The perils that are not covered are called "exclusions," and every policy has them. Find out what they are now, rather than at claims time. They are listed on your insurance policy. Ask your insurance provider to explain the exclusions before you buy the policy. If you're shopping around, make sure you're always comparing apples with apples -- not all insurance policies are alike. And, while minor price variation among companies offering similar kinds of coverage is likely, if one insurer is charging substantially less, beware. It may not be the ideal company to deal with at claims time." Shop with PolicyBachat.com with the assurance that your personal information such as your name, address or phone number will NEVER be distributed to any party(ies) outside PolicyBachat.com.